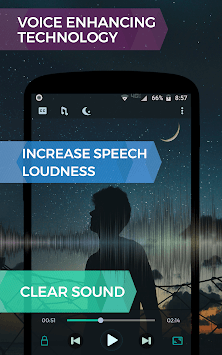 The first video player for Android with speech loudness enhancing feature, optimization and normalization sound for the most comfortable viewing. In all films, TV shows, cartoons, and so on. without exception, there are sharp drops in the volume of sound that make viewing the video not comfortable, especially if you are watching movies at night. Volume drops, too loud special effects, the sound of gunfire and, for all that, the speech is too quiet, if it annoys you - then this video player is for you! 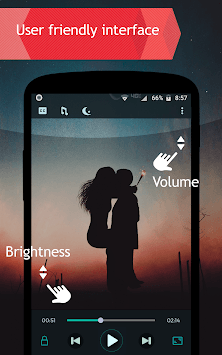 Night Video Player uses its unique and super fast algorithm to detect human voice, and process audio on the fly, while watching a video. some audio elements that used to be too quiet compared to other sounds and you just could not hear them. And with all this, you will not be disturbed by loud shots, screams, and all other harsh sounds, the Night Video player will make them quieter and more pleasant for perception. ▶ Night video player reads absolutely all video formats - MKV, MP4, AVI, MOV, Ogg, FLAC, TS, M2TS, Wv, etc. ▶ FULL HD, 4K, support for all codecs - AC-3, AAC, HEVC (H.265), VP9, H264, MPEG, AAC, OGG, etc. ▶ Night Video Player doesn't have any suspicious permissions. - play original audio without normalization. 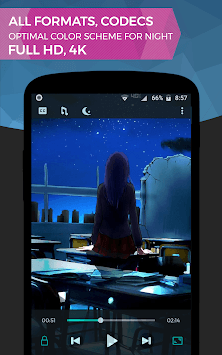 In this 'night mode', smart leveling of special-effects will be applied, the volume of the human voice will be increased. The entire audio track will also be normalized. * All graphic material are free and all FILMS are fictional.